Benji hit it big in the early 1970s, and just like Hollywood does today, it thought "hmm, how can we rip off this profitable and popular media success?" Benji continued to crank out the movies, but the small screen got itself a Benji-like dog, "Here's Boomer." Bark if you remember this! "Boomer" had some serious star power, though. Check out that guest list! It's like a who's who of the late 1970s! Todd Bridges, Scott Baio, Tom Bosley, Rosanna Arquette, Michael J. Fox, Roddy McDowell, even Jonathan "Soon to be Riker" Frakes. Anyway, here's some oh-so-1970s opening credits. 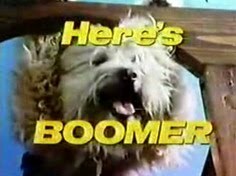 Do you remember Boomer? Or Benji? OMG I do not remember that at all-however I did love the 'Benji' movies. I am a children's librarian and recently showed the original 'Benji', having not seen it for about 30 years. Soooo slow- I can't believe today's kids were willing to sit for it- I was falling asleep. I don't know if I watched it, but I remember the title. Inslso remember C.H.O.M.P.S. I totally remember Here's Boomer. I can't remember but I think it was on the same night/line-up as Greatest American Hero. I LOVED Here's Boomer.